Embroidery of the frockcoat started well; I started on the back 2 panels, and loved the way it came together there. The right front panel was done. Then I messed up the left front panel. Redoing 6 panels of embroidery cost me approximately $100 in thread/silk, and put me a week behind schedule. As for the embroidery of the coat itself, after much experimentation, I came up with a way to stiffen the silk taffeta enough to not pull too much with the heavy embroidery. I ended up backing the silk taffeta with a layer of iron on adhesive, and then a layer of pellon polyester interfacing. Of course this made the coat profoundly stiff, but did stand up beautifully to the embroidery, not pulling much at all. Tradeoffs I guess. I did attempt to do cotton interfacing but could not find a good one that worked as well as the polyester. It broke my heart a little to have to give up and use polyester, but… I guess if I were in the 18th century, I would go with whatever looked best too! Bah! Unlike a lot of my friends, I am a profoundly slow seamstress and tend to stress myself out when I get too close to a deadline. Due to having to redo the left front panel of the coat, I actually finished 2 days prior to leaving for CoCo 2017. Many thanks to the hubby for providing me wine and vodka when sewing got stressful. Two pieces sewn together; I just loved how I made the vent fancier. NEVER start an embroidery before you’ve had coffee. This is where I messed up big time. How it should have looked. Trial wearing of the frock coat. The collar was hand sewn on for maximum prettiness. I did to go to a LACMA exhibit on men’s clothing, (on loan from the LACMA but at the SLAM in St. Louis) and got to see several frockcoats in person. One thing I found to my surprise was that the coats were lined to the edge with linen! I was absoulutely thrilled to find that out – what I had done to my coats out of sheer laziness, was actually being done by the actual people of the 18th century! Note the lack of silk facing on the inside of the coat like many modern coats; rather you see linen lining all the way to the edge. Look at the beautiful mesh interlay. I have no idea how i would ever get my machine to do something like that…. In any case, I took the easy way out and ended up iron interfacing the hem along the bottom of the frock coat. Not only did the iron on adhesive glue give me no stitching across the end for a clean look, it also stiffened the bottom giving me a beautiful sway with the coat. Iron on adhesives man. Amazing. If they had that technology in 1740 they would have used it. Along with iron on adhesive. And epidurals for labor. Just saying. Similarly, I ended up sewing the hem to the edge with no facing. I did put in machine made button holes; but may I say, unless you’re super confident with button holes to do machine ones? I find that the machine embroidery tends to unravel rather obscenely. Save yourself some heartache and get yourself a button hole kit with a clear button holder. This way you can clearly center your design. I usually print 10 buttons/ 12″x7″ sheet; no use being too greedy with this since you want to have enough room to cut buttons out with ease. After you do make your buttons, get some nice epoxy glue and glue the back together. I find that the embroidered silk is thicker so that the button wants to fall apart with any stress. The glue helps that immensely. Prepare to make extra buttons. Even with a ton of practice, 1/4 buttons turn out hideous. So after putting the metal top part of the button into your button maker, pull on the edges of the fabric all around to remove wrinkles. Wrinkles are your enemy. Then tuck it all in, and place the back piece on. Pop it out. Glue it. Wait 12 hours. You’re set! Line up your embroidery with the inner seam line yuo’ve drawn on the pattern. For some edges, I don’t bother tracing, I just draw in a 5/8″ seam allowance with a ruler and chalk. Cut on the inside line of the pattern. Please note all the blue guide lines I’ve sewn in to help align my pattern. Those get removed. Note the finished clean piece. Buttons sewn with the tear off interfacing removed. Align in to the center of your button press. Please note how awesome the clear button presses are as opposed to opaque ones. Trim off edges as you need. Place in the front button cap. Pull on the edges until you have no wrinkles. Glue it. I use epoxy but whatever you like works I guess. I iron in all the edges and glue them down with iron on adhesive hem tape. Then I pin on the lining. Whip stitch it into place. Even the darts. Note that I used eyelets for the back of my waistcoat. But this is before I found out that it wasn’t done on all vests and were usually done later to acommodate expanding waistlines. Breeches were done using the JP Ryan pattern. I made no adjustments on the muslin other than removing 1″ of bulk from the back of the pants. I also changed the instructions by flat lining my silk taffeta as the fabric seemed incredibly thin. 5 stars out of 5. 10 out of 10 Stines would use this pattern again. My one suggestion – follow the instructions to the letter. They are GOOD. Overall, I can honestly say that I LOVED making and wearing this coat. It was honestly a giant blast to make – especially since I gave myself two full months of just working on this. It was also my most comfortable costume by FAR. No corset, comfy linen shirt, comfy linen pants, and great range of motion. I mean, I know that we’re trying to take back the corset by dispelling the notion that everyone tight laced and women were fainting left and right – and it’s true! 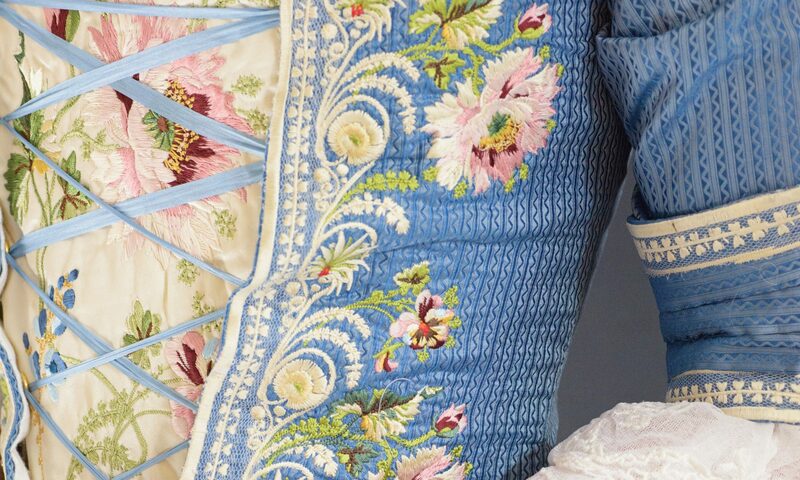 Corsets are not the monstrosity everyone claims they were. That being said, OH MAN THIS WAS COMFY. There is something to be said for full range of motion of legs, arms and body. On top of it, I just find machine embroidery and sewing to be incredibly relaxing, especially after a long day (literally, 24 hours at a time) of work. So highly recommended as a hobby. Now, time to get Duran Textiles to respond to my messages so I can get started on Frock Coat #3!